University Heights’ Trolley Barn Park is the setting for Friday night concerts July 8 through Aug. 5. Shows run 6:00 – 8:00 pm and feature a lineup of hot local groups, from Billy Lee & the Swamp Critters to Sue Palmer & her Motel Swing Orchestra. Coronado’s Promenade Concert Series is set at that community’s Spreckels Park. Performances begin at 6:00 pm on Sundays now through Aug. 28. Concerts on Sept. 4 and 11 begin at 5:00 pm. Bands booked offer a diverse range of music – from the Navy’s Southwest Wind Ensemble to local favorite, Rockola. Del Mar’s Summer Twilight Concerts are set for Powerhouse Park, overlooking the Pacific at 1600 Coast Blvd. Shows begin at 7:00 pm on the third Tuesday of June, July and August. There’s a 5:00 pm concert set for Sunday, Sept. 18. Atomic Groove opens the season, followed by Rockola, Mrs. Robinson and the Sensation Show Band. Picnic, dance and wait for the green flash. Carlsbad’s 26th season of TGIF Jazz in the Park will be staged at three community parks this summer. The season opens at Stagecoach Park (3420 Camino de los Coches), with concerts on June 24, July 1 and 8. The party moves to Poinsettia Park (6600 Hidden Valley Road) for concerts on July 15, 22 and 29. The season closes at Calavera Hills Park (2997 Glasgow Drive) with concerts on Aug. 5, 12 and 19. Showtime is 6:00 – 8:00 pm. Escondido’s “Saturdays in the Park” concerts are set for June 25, July 9 and 23, Aug. 6 and 20 at Grape Day Park, 321 North Broadway. Shows start at 7 PM. Get down to everything from 70s soul to rockabilly. La Mesa’s Sundays at Six concert series opens on June 12 and continues Sundays, 6:00 – 7:00 pm, through July 24 at Harry Griffen Park, 9550 Milden St.
El Cajon Concerts on the Green are already underway – staged at Prescott Promenade (across from City Hall) every Friday evening through Sept. 30. Showtime is 6:00 – 8:00 pm. Downtown sizzles with rock‘n’roll, bluegrass, country, big band sounds, Latin beats, jazz and world music. The family oriented venue is smoke-, alcohol- and dog-free. 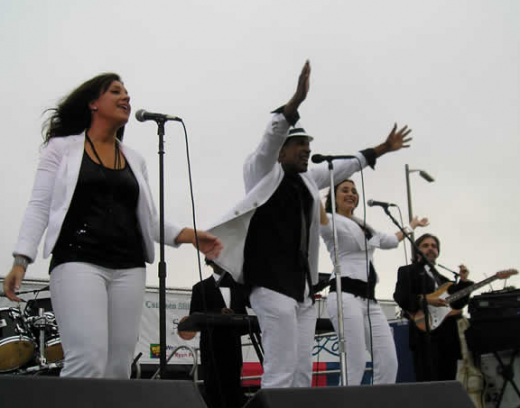 Santee’s Free Summer Concerts are scheduled from 6:30 – 8:30 pm Thursdays June 16 through Aug. 18 (except July 7). This year’s venue, Town Center Community Park East (550 Park Center Drive), includes amphitheater seating, a raised stage playground and concession stand – but picnics are welcome. Lemon Grove’s Concerts in the Park are set for Thursday evenings, 6:30 – 8:00 pm, from July 7 through Aug. 11. Shows, featuring popular local bands including the Cat-illacs and Y3K, are staged at Berry Street Park, 7071 Mt. Vernon St. The Chula Vista Village Vibes concert season begins at 6:30 pm on July 13 and runs six consecutive Wednesday evenings. Enjoy classic rock ’n’ roll, blues, Motown, reggae or jazz at the Memorial Park Bowl in CV’s Third Avenue Historic District. Pack a picnic or grab eats at one of the 25 restaurants along Third Avenue. This entry was posted in Arts & Culture, Attractions, Outdoor Adventures and tagged concerts, free, music, north county, south bay, summer by Alison. Bookmark the permalink. Hi – just wanted you to know that the Point Loma Summer Concerts are running from 5:30 – 8:30 this year. The concerts begin with talent on our “Kids Community Stage,” which highlights the concert series’ support of Music Education.